You receive a Certificate of Registration. There exists prima facie evidence that you own the copyright in question. You have the right to sue for copyright infringement. It is easier to obtain international copyright protection. You can possibly receive statutory damages and attorneys fees. One of the most important benefits of having a registered copyright with the U.S. Copyright Office, is that you can sue an infringer for copyright infringement. It may not seem like a big thing now, as you are not thinking about filing a lawsuit. But if, and when, the time ever comes when you need to take an infringer to court, it is better that you invest now–within 90-days after you publish your work–rather than have to pay for expedited registration fees and also risk not getting everything you deserve. Copyright registration fees are around $35 if you do it yourself and do it online. If you wait and register after someone starts to use your work, the costs will be considerably higher. The other important reason to register your work immediately after you publish it is that if you ever have to sue, an attorney is more likely to take your case if they can potentially receive attorneys fees. It is important to pursue copyright registration in a timely manner. That means, register your work within the first 3-months of publication. If you do so, you may become eligible to receive fees set by the government, what we call statutory damages. This could be of real benefit, as those fees range anywhere from $750 per infringement all the way up to $150,000 per infringement, if it’s proven that the infringer intentionally and willfully infringed your work. Now isn’t that a good reason to get that valuable creative content registered? Finally, with a registration, you have solid ground for sending a “cease and desist” letter to any person who infringes your work. This usually encourages people to STOP using your work without permission, or purchase a license from you. Sometimes the threat of a lawsuit goes a long way. Just be careful not to threaten a lawsuit, unless you are truly ready to file that suit. 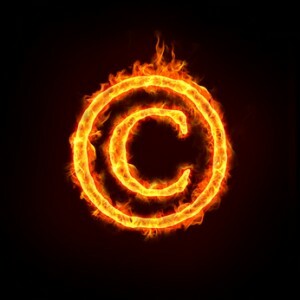 The advent of the Internet, while a wonderful and advantageous communication tool, has created new issues for copyright owners. It has made access to creative content easy, and has also made content easy to create, easy to disseminate, easy to display, and easy to reproduce. As a result, many people think that if it is on the Internet, it is free. People often conclude that if copyright is not mentioned when they view a creative work or there is no copyright symbol on the work that they can use it for any purpose they want. The reality is that the work is in fact copyrighted regardless of whether the author mentions the copyright or not. Whether it’s because they lack the knowledge or just don’t care, copyright infringement on the Internet is rampant. So as a creator of valuable content PROTECT YOUR ASSETS! Take the extra step to protect what you have invested time and money in creating. And, as a general rule, if something is on the Internet and YOU didn’t create it, assume that someone else did. Assume that if someone else created it, you need permission to use it. Permission can come in the form of a license, a contract, public domain (no one owns it or the copyright has expired), or that your permission is granted through the fair use exception. CAVEAT: To take advantage of the Fair Use Doctrine, make sure you understand the rules, or risk being sued for copyright infringement.